PARIS, Dec 3, 2013/ — When we say, “wearable art”, there is usually a bad taste in our mouth. 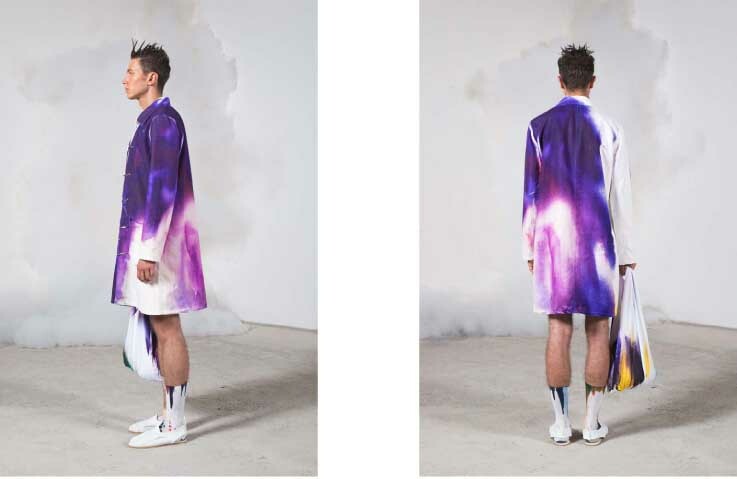 But, Julian Zigerli’s Spring/Summer 2014 collection dissolves the wall that separates clothing, art and environment, thus truly making it a work of art which also happens to be part of your wardrobe. Entitled, “At the End of the World to the Left”, Julian created the collection in collaboration with German-born artist Katharina Grosse whose paintings are known for color and imagery. Through the print collaboration with the Berlin-based artist Katharina Grosse, Julian developed a collection of designs that embody this abstract space. This tight artistic alliance pushes not only the boundaries of the fabric, but also dissolves the wall that separates clothing, art and environment. Julian Zigerli’s men’s collection stands for useful, smart and high tech quality pieces with a sporty touch. There is always a lot of love, colour, humor and positivity involved in his designs.